This website contains copyrighted material, trademarks, and other proprietary information, including, but not limited to, text, software, photos, video, graphics, music and sound, and the entire contents of this website are copyrighted as a collective work under the United States copyright laws. Unless otherwise indicated, NFL Gridiron Gab owns a copyright in all original information contained in this Web site, including the selection, design, arrangement, and enhancement of such materials. Except as otherwise expressly permitted under copyright law, all rights are reserved by NFL Gridiron Gab and content may not be reproduced, modified, used in the creation of derivative works, downloaded, disseminated, published, transmitted or transferred in any form or by any means, in whole or in part, except with the prior written authorization of NFL Gridiron Gab. In the event of any permitted copying, redistribution, or publication of copyrighted material, no changes in or deletion of author attribution, trademark legend, or copyright notice shall be made. Any material copyrighted by third parties that is used on this site is done so in good faith pursuant to the Fair Use doctrine. If you are the owner of copyrighted material used on this site, and you feel its use violates the Fair Use doctrine and other copyright laws, please contact the site administrator. All trademarks, product names and company names or logos cited or contained herein are the property of their respective owners. All information on this Internet site is protected under the intellectual property laws of the United States. 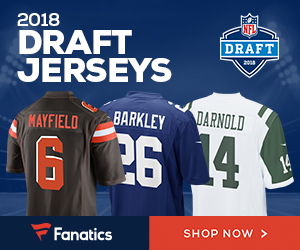 You may not use NFL Gridiron Gab’s name or any material contained on the NFL Gridiron Gab site to imply endorsement, sponsorship, or affiliation with NFL Gridiron Gab in any manner without prior written authorization. You should not construe the information on the NFL Gridiron Gab Internet site as a recommendation for the use or manufacture of any product, process, equipment or formulation. Copyright infringement is a violation of federal law subject to criminal and civil penalties. All images contained on this web site have been captured from the public domain unless noted otherwise. NO REPRESENTATIONS OR WARRANTIES, EITHER EXPRESS OR IMPLIED, OF MERCHANTABILITY, FITNESS FOR A PARTICULAR PURPOSE OR OF ANY OTHER NATURE ARE MADE HEREUNDER WITH RESPECT TO INFORMATION OR TO ANY PRODUCTS TO WHICH INFORMATION REFERS. The information contained on the NFL Gridiron Gab Internet site, and NFL Gridiron Gab policies and disclaimers concerning your access to and use of the site, are subject to change, and NFL Gridiron Gab reserves the right to modify them at any time without notice. Although every effort is made to present current and accurate information, NFL Gridiron Gab makes no commitment to update or correct any information that appears on the NFL Gridiron Gab Internet site. Portions of NFL Gridiron Gab Internet site may allow users to post their own material. The materials posted by users do not necessarily reflect the views of NFL Gridiron Gab. By posting materials to the NFL Gridiron Gab Internet site, you represent that you have all necessary rights in and to such materials, and that such materials will not infringe on any personal or proprietary rights of any third parties, nor will such materials be harmful, defamatory, unlawful, threatening, obscene, lewd, lascivious, harassing, or otherwise objectionable. NFL Gridiron Gab reserves the right, at its sole discretion, to edit or delete any material posted by users that NFL Gridiron Gab for any reason whatsoever determines may be harmful, defamatory, unlawful, threatening, obscene, lewd, lascivious, harassing, potentially in violation of any party’s rights, or otherwise objectionable. NOTWITHSTANDING THE FOREGOING, NFL GRIDIRON GAB EXPRESSLY DISCLAIMS ANY RESPONSIBILITY OR LIABILITY FOR ANY MATERIAL COMMUNICATED BY THIRD PARTIES THROUGH THIS WEB SITE. By posting information and materials to the NFL Gridiron Gab Internet site, you authorize NFL Gridiron Gab to use, and authorize others to use, any such materials in any manner or medium. Be the first to comment on "Terms and Conditions"